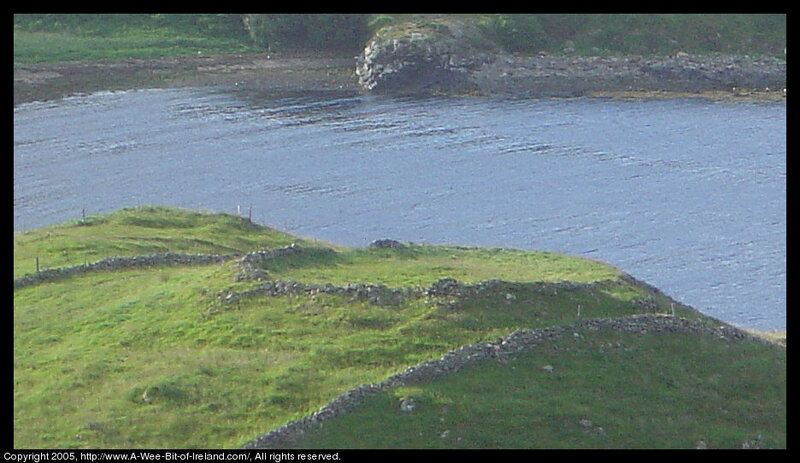 A photograph of a ring fort from late pre-christian or early christian times near Kilcar Village, Donegal. This ring fort was likely on an island 1000 years ago. On an old map, I saw a mention that local people named it island. The ice of the last ice age was so heavy that it depressed the earth and it is springing back now that the ice is gone. This rising of the land is fastest in northwest Ireland and is very fast in geological time, but very slow as people experience it. The land in much of Ireland has been rising faster than mean sea level has been rising for the last few thousand years. For the earth as a whole, sea level has been rising, but in North West Ireland, the land has been rising faster than sea level so that relative sea level (RSL) has been falling. If the Greenland ice cap or the West Antarctic ice cape were to rapidly melt in the next several decades, then sea level will rise much faster. New seismic stratigraphic, vibracore and AMS 14C dates from two sites off the Northern Ireland coast yield information on the deglacial to present sea-level history and shelf evolution of the region. A lowstand of sea level at about 30 m below present sea level recorded by fossils in a lowstand shoreline deposit occurred around 13.4 cal ka B.P. following a period of rapid isostatic uplift associated with a RSL fall of 6.7 cm/yr. Following the lowstand, contrasting styles of sedimentation characterized the two study sites. In the sheltered environment of Belfast Lough, the lowstand shoreline was overtopped and buried by transgressive facies of intertidal and shallow sub-tidal mud and sandy mud. On the high-energy Portrush coast, the inner shelf sedimentary sequence is characterized by a basal conglomerate overlain by well-sorted sands with occasional interbedded gravel. Copyright 2006 Elsevier B.V. All rights reserved. I also photographed a ring fort in County Kerry in May 2007. There is a large, famous ring fort in northern County Donegal near Inishowen. Colin K. Ballantyne 1 *, Danny McCarroll 2, John O. Stone 3 1School of Geography and Geosciences, University of St Andrews, Fife, Scotland, UK 2Department of Geography, University of Wales Swansea, Swansea, Wales, UK 3Department of Earth and Space Sciences and Quaternary Research Center, University of Washington, Seattle, Washington, USA email: Colin K. Ballantyne (ckb@st-and.ac.uk) *Correspondence to Colin K. Ballantyne, School of Geography and Geosciences, University of St Andrews, Fife KY16 9AL, Scotland, UK. Ballantyne, C. K., McCarroll, D. and Stone, J. O. 2007. The Donegal ice dome, northwest Ireland: dimensions and chronology. J. Quaternary Sci., Vol. 22 pp. 773-783. ISSN 0267-8179. Geomorphological evidence indicates that Donegal was formerly occupied by an ice dome that extended offshore to the west, northwest and north and was confluent with adjacent ice masses to the east and south. Erosive warm-based ice over-rode almost all the highest mountains, implying an ice-divide altitude greater than 700 m. Only six peripheral summits escaped glacial modification, implying either that they remained above the ice surface as nunataks or supported a thin cover of protective cold-based ice. Gibbsite, a pre-last glacial weathering product, is preferentially represented on summits that escaped glacial modification. Cosmogenic 10Be exposure ages of 18.6 � 1.4 to 15.9 � 1.0 k yr for coastal sites confirm that Donegal ice extended offshore at the last glacial maximum. Reconstruction of the form of the Donegal ice dome suggests a former minimum ice thickness of 500 m close to the present coastline in the west and northwest, and 400 m near the coast of the Inishowen Peninsula in the north, with the ice extending at least 20 km across the adjacent shelf to the west and northwest. Copyright � 2007 John Wiley & Sons, Ltd.